Three of the 2018 Goldman Environmental Prize recipients – Makoma Lekalakala, Liz McDaid and Khanh Nguy Thi – shared experiences from their incredible fights for clean energy. The winners then joined a conversation with experts on environmental activism in the energy space, and regional approaches on the transition to clean energy. Standing Up for Their Communities, 2 Women Killed a $76 Billion Secret Nuclear Deal in South Africa: Q&A with Goldman Prize Winners Makoma Lekalakala and Liz McDaid: South Africa went over the public’s head in negotiating a backdoor nuclear deal with Russia. When these activists found out, they brought their case for renewable energy to the public – and won. Vietnam’s Champion for Renewable Energy: Q&A with Goldman Prize Winner Khanh Nguy Thi: The 2018 Goldman Environmental Prize for Asia went to Khanh Nguy Thi from Vietnam for her work in clean water and renewable energy. This is her story. Environmental activists across the world are fighting to protect local resources despite increasing exposure to threat. They stand up to powerful corporate and political interests, refusing to be silenced. 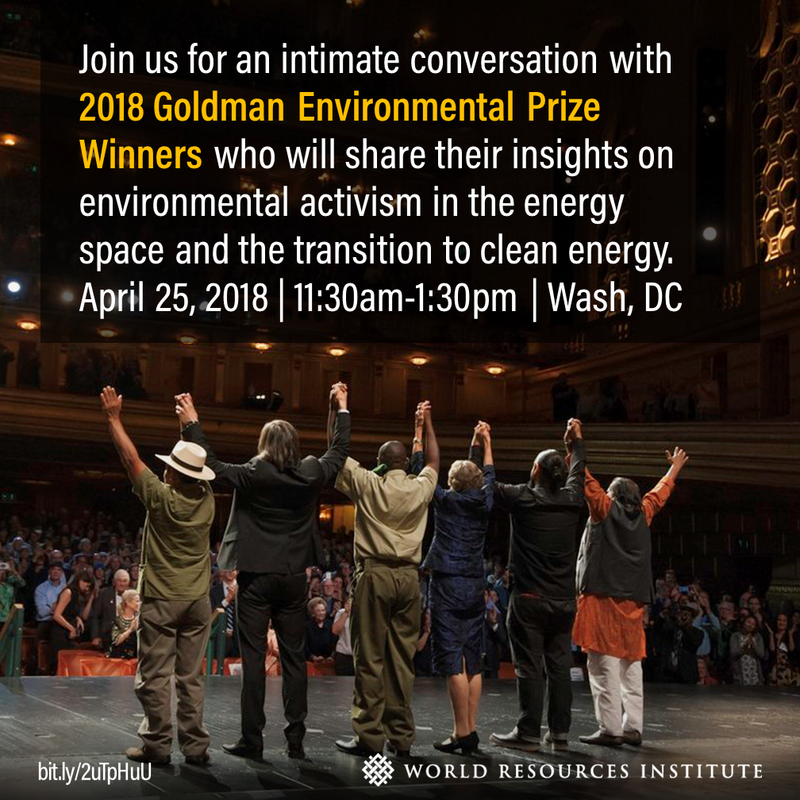 On April 25, 2018, WRI recognized Makoma Lekalakala, Liz McDaid and Khanh Nguy Thi, three of this year’s prestigious Goldman Environmental Prize winners. As grassroots activists, Makoma Lekalakala and Liz McDaid built a broad coalition to stop the South African government’s massive secret nuclear deal with Russia. On April 26, 2017, the High Court ruled that the $76 billion nuclear power project was unconstitutional – a landmark legal victory that protected South Africa from an unprecedented expansion of the nuclear industry and production of radioactive waste. In Vietnam, Khanh Nguy Thi used scientific research to engage Vietnamese state agencies to advocate for sustainable long-term energy projections. Highlighting the cost and environmental impacts of coal, she partnered with state officials to reduce coal dependency and move toward a greener energy future in Vietnam. After sharing their incredible stories, Lekalakala, McDaid and Thi joined an intimate discussion with experts on activism in the energy space and regional approaches to the clean energy transition. The Goldman Environmental Prize recognizes individuals who have undertaken significant efforts to protect their communities and the environment, often at great personal risk. The prize is one of the most prestigious environmental awards in the world, which honors activists from six continents each year.